My first trip to the Edinburgh International Film Festival this year was to take in the European Premiere of the latest film from Colombian director Rodrigo Garcia, ‘Last Days in the Desert’. The film stars Ewan McGregor in a dual role as both a holy man (Jesus, for all intents and purposes) and a demon, who encounters a family as he spends time out in the wilderness before returning to Jerusalem. The film is slow burning, meditative and difficult to get into, but it does feature some of the most beautifully arresting cinematography in the Colorado Desert, where the film was shot (by ‘Gravity’ DP, Emmanuel Lubezki). 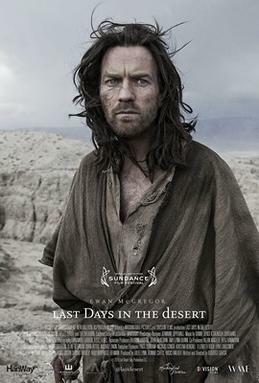 Ewan McGregor is excellent in his dual performance, discussing how he can intervene in the fate of the family he encounters in the desert without compromising nature and god’s will. The riposte between these two versions help to shade in the character motivations of the holy man as well as posing interesting views on the nature of fate and coincidence. The film is largely built on mood as opposed to plot, and the strong performances throughout help to elevate the slight material, with Ciaran Hinds, Ayelet Zurer and Tye Sheridan making up the family the holy man encounters. We learn about their problems, their ambitions and their struggles, and coupled with the foreknowledge the holy man has, he must decide to what extent to involve himself in their fates. The restrained approach, coupled with the outstanding cinematography and contemplative score helps to build an inviting atmosphere, but unfortunately it comes at the expense of the narrative. There’s human drama to be had here, but Garcia paces his film so slowly, so meditatively that we’re left with little to cling on to. The sparse soundtrack is quietly atmospheric and helps to colour in the wonderful vistas of the desert, and the film undoubtedly looks and feels superb, but ultimately it feels lacking.in character and plot. ‘Last Days in the Desert’ is a beautifully sculpted film that poses interesting questions about family, compassion and sacrifice, but this religious fable never manages to transcend into something greater.